So I have been using OpenRCT2 on my Windows 7 PC with no major problems for a while now. I am having problems getting it to run correctly on my Windows 10 PC though. I bought the games of GOG.com even though I also own physical copies of the games. Bought both RCT1 & 2 with all expansion packs. The games installed fine, no problems. Installed OpenRCT2 with no problem. The problem is with loading the game. It seems to always ask me for the installation path for RCT2, which I select, and then it opens the game fine. But when I close the game and reopen it, it is asking me for the path again and it won't save any of my settings at all. Even when I try and get it to see the RCT1 path and it says to restart, it just asks me for everything again. When I open a RCT2 game it runs fine with no problems. I will not attempt to answer your main question as I am still new here as well, someone will help you soon. However, you are limited to one post in the first 24 hours of your first post on this forum, I am sure is to prevent spam. 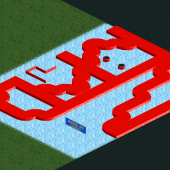 Make sure OpenRCT2 has the rights to write the settings file. Does saving games work? This forum has some anti-spam features. You can not post again within 24 hours of your first post. After one day, the limit is removed.